AN EXCELLENT EXAMPLE of a VERY RARE 125 BHP SX SPEC MODEL! This WHEEL CHAIR ACCESSIBLE VEHICLE comes with FULL CITROEN SERVICE HISTORY and is an Ex-Motability vehicle that has undergone a full WAV conversion by MC Emeel which includes an Electric Winch, Lowered Floor with Rear access ramp, Qstraint electric locking front retractor anchor points with Qstraint 360 "Slide 'n Click" rear retractor anchor points. It has 3 seats in the front (including the driver) and then 2 further seats in the rear with a space for the wheelchair user in between these meaning the wheelchair user is not isolated in the boot area like with some other WAV conversions. 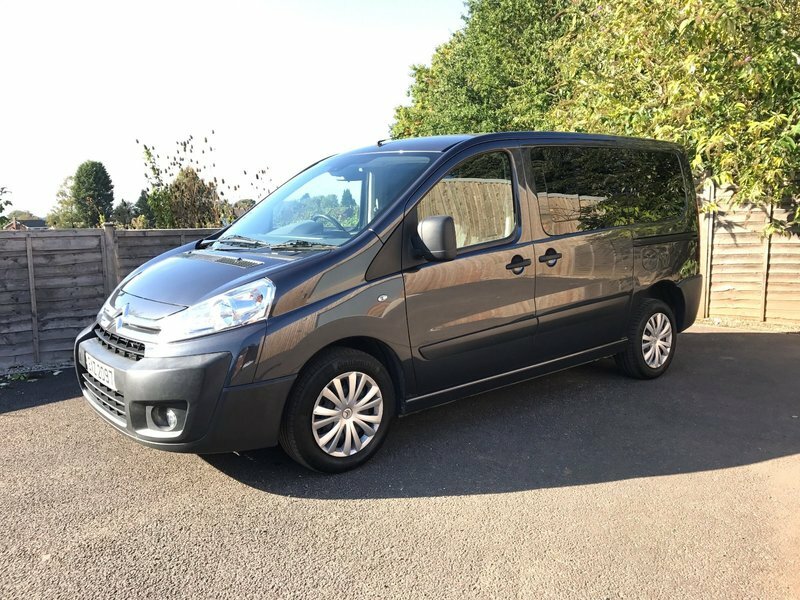 This means there is room for a total of 6 passengers including the wheelchair user, and also that there is still a large boot area available even with the wheelchair user on board! It is also unlike many other Expert/Dispatch WAV Conversions in that the rear is not just finished like a ply lined van. It has speakers and door cards in the rear too, meaning it is far quieter and more refined than some others available. Other Specifciation includes Radio/CD with remote audio controls, Driver information system, Air conditioning, Electric windows, Electric mirrors, Automatic headlights, Automatic wipers, Front and rear foglights, Rear privacy glass, Rear passenger view mirror, Rear power outlets, Sliding rear doors, Overhead storage, Front cup holders, Power assisted steering, ABS, Remote central locking with Immobiliser and 2 keys, Adjustable steering column/wheel, Adjustable seats, Front and rear head restraints. This vehicle has just arrived and is awaiting a pre sale inspecition and full valet with more photos to follow. It benefits from FULL CITROEN SERVICE HISTORY having been serviced on 10th April 2014 at 9,644 miles, on 13th April 2015 at 20,263 miles, on 06th May 2016 at 27,696 miles, on 26th April 2017 at 30,862 miles and most recently on 12th April 2018 at 37,015 miles. FREE 12 MONTHS AA BREAKDOWN COVER available as well as a FREE 6 MONTHS WARRANTY and a FULL 12 MONTHS MOT to be arranged by us at the point of sale. This vehicle also comes with the optional private plate "EXZ2097" but can however be put on to an age related standard plate if preferred. We currently have very competitive FINANCE and PART EXCHANGE facilities available. All our vehicles are HPI clear with a certificate provided. Appointments available 7 days a week. Please feel free to phone or email with any queries you may have or to arrange a viewing.